Is it going to be better the second time? I visited Kris with a View in 2014 and had an average experience with the food but totally loved the ambiance! In 2016, I realized that I never scanned the restaurant carefully, it is quite spacious with different seating arrangements along with a separate bar area. The Pan Asian restaurant is located on the 19th floor of Park Regis Kris Kin Hotel with amazing panoramic views and you may enjoy the old and modern city from above and you also may wonder a little. Kris with a View offers reasonably priced theme nights buffet or you can go for à la carte menu! The manager was kind enough to let us try courses from the menu and preview the buffet as well. Our server, Suman was attentive and the services weren’t disappointing at all. The restaurant has a fine selection of drinks but as we don’t consume alcohol, we opt for pure mixes. Both, Kris Kin Cooler and Berry Times 3 were refreshing and a great start to our discovery! Malay-Satay- Succulent chicken and beef skewers marinated with spices and served with peanut sauce. Truth to be told, I think I never had peanut sauce before and I absolutely loved the smooth and creamy texture with a hint of spice. Prawn Koli Vada- We were warned that this is going to be spicy but we always like challenging our taste buds. (If your tongue is sensitive, like me, you might want to avoid this as it was quite spicy) These were deep-fried, crispy, full of flavour and red in colour as for the chilli powder. Simply delicious and made a great starter. 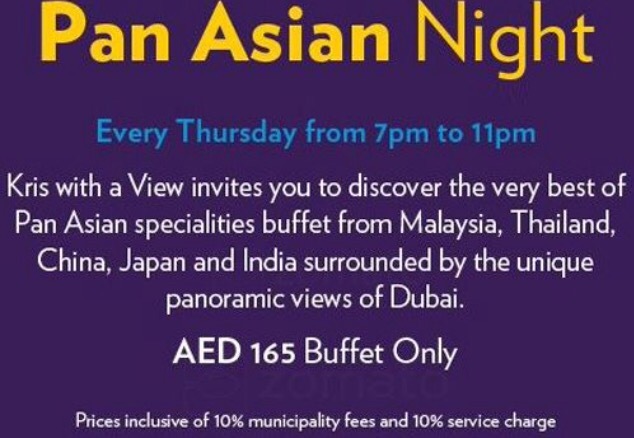 We choose Pan Asian themed night (Thursday) and it had variety of dishes from Malaysia, Thailand, China, Japan and India. The buffet was placed through out the restaurant making the experience comfortable with plenty of space to move around. I liked the traditional fan background design and cute little Japanese dolls placed on the counters which gave a very Asian vibe. The vegetable Spring roll wasn’t crispy at all, both Chicken lollipop and Samosa were average. An exotic Tandoori flavourful Snapper with a sweet, firm, textured flesh and any sauce would made a huge difference but a better difference so don’t forget to get your favourite sauce from the separate sauce dedicated counter. This was my favourite from the buffet, Chef Linda makes customized noodles live in-front of you. Noodles with egg and few vegetables were fresh, delicious with huge portion which made our tummies very happy. Must have! Well presented Indian/Pakistani sweets and creamy cakes! I had the strawberry mousse cake and it was everything sweet and nice. I also tasted a scoop of Coconut Sherbet but didn’t fancy it at all. Overall, it was kind of a successful discovery and it was better the second time. It’s a wonderful place for a romantic date or a drink with friends because who doesn’t like reasonable priced food with breathtaking view and live music? Altho, I did feel the variety is a little less but it is very affordable and all the theme nights have different rates. Thank you Iman Syami, Lynn, Madelanie, Suman and rest of the team!